One plate of specified weight. These replicas of York's classic plates from decades ago are a favorite among weight lifters who appreciate York's place in history and their reputation for quality plates and bars. They will match other vintage York plates of this style that are sitting around in garages. The vintage style deep-dish design makes it easy to grip the plates with one hand, eliminating the need for modern style plates with grip holes. York calibrates these plates to within 2% of the marked weight and rejects any that don't come out right. In reality, the accuracy is usually very close to dead-on. You can't get a better guarantee than 2% plus or minus for iron plates. The 450mm diameter of the 45lb and 100lb plates position the bar at a standard height off the floor, making them ideal for deadlifts or cleans. 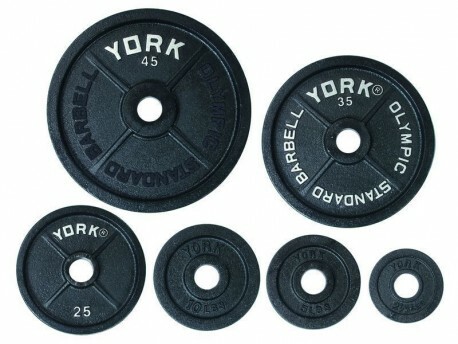 These plates, and all of York's current models of plates, have a relatively loose fit on bars made with strict 50mm (1.97") diameter sleeves.